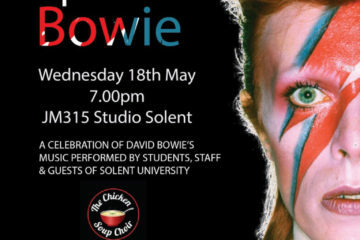 Musical students and staff from Southampton Solent University celebrated the life of David Bowie in song on Wednesday 18 May 2016. Bowie fan and popular music journalism course leader Prof Martin James also performed alongside his students. “It was both an emotional and inspiring experience performing a Bowie song with students. Emotional, because the song we played was Lazarus, which as well as being one of his last, deals directly with death.